Reviewer borrowed this book from the public library. Ever since I learned of Atlantis and the Anasazis, I have been curious about ancient history. Therefore, when I saw Mysterious Bones on display at Holiday House's booth at the American Library Association's annual conference in NOLA, I couldn't wait to get back home to read it and find out how the Kennewick Man fit into the mystery of the Ancient Ones. This book is more than a forensic anthropological mystery. It also brings up the ongoing debate over who owns these ancient bones archeologist unearth. Do they belong to the scientists or the Native Americans who regard them as their ancestors. The bones were accidentally discovered on the banks of the Columbia River in Kennewick, Washington on a Sunday afternoon, July 28, 1996. Through testing it was found these bones were of a man who lived 9,500 years ago. The bones, named The Kennewick Man, is the oldest skeleton every found in the Americas. Their discovery challenged the scientific community's theories on who our early ancestors were and where did they come from. "The scientists continue to suggest that although Kennewick Man does not belong to any modern ethnic group, his bone measurements resemble those of Polynesians and the Ainu, a generally light-skinned (though not Caucasian) people. The Ainu are credited as being the first settlers of Japan." 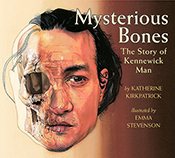 Kirkpatrick's thoughtful treatment not only chronicles the finding of the bones, but also the ensuing nine year court battle between the U.S. Army Corps of Engineers and The Confederated Tribes, made up of the Umatilla, Walla Walla, and Cayuse peoples, who wanted the bones returned to the earth as soon as possible. The book's design is uncluttered, yet there is a lot to see and read. Interspersed throughout the text are sidebars to help explain in more depth topics raised in the text. There are maps of "Migrations into the Americans". Emma Stevenson's detailed illustrations, done in gouache on watercolor paper, are excellent and further enhance the reading experience. Another sidebar about the Clovis Mystery states that the Clovis people lived two thousand years before Kennewick Man was born. "After inhabiting North America for about three hundred years" vanished. This book is not something one can read quickly. 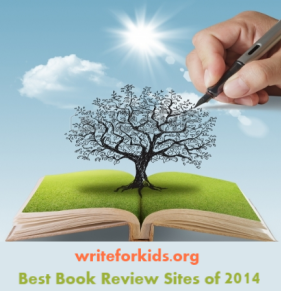 It is thoughtful and meant to be read slowly so as to absorb all the fascinating details. Includes glossary, time line, bibliography, research and source notes, and index. For those students who are curious. Go to the author's web site to read about her experience writing of this book. I'm with you about ancient history - more please. I like that this book includes information about repatriating the bones. Good addition for the Doucette Library's collection. Thanks.